The crew of a colony ship is in route to an earth-like planet where the new colony will be established. The plans have been laid down so perfectly, but when another uncharted world somehow shows up on the radar, they take a detour to investigate. Plans and timetables for completion be damned—and so too all those safety protocols that must be followed when you arrive on a new world—they just had to investigate. What should happen to a captain who OKs putting a sleeping crews’ lives at risk? Mull that over as you read. Surely there is no real danger of an alien infection and/or predator-prey dynamics to be concerned with? When the crew arrives on this surprise world and finds out that the whole thing was a really bad idea, what hits us so wrong is their not being in any way surprised to find…oh, just another planet that is not only habitable, but one that has some of the exact same types of life (like wheat) that earth has! Another thing that reaches out and touches us wrong—the characters, all anemically constructed so that we don’t really care who lives or who dies. Despite long efforts at character-building, we come away unimpressed with most of the people we are given. Michael Fassbender, however, is the huge exception. He does an amazing job as “David” / “Walter”. 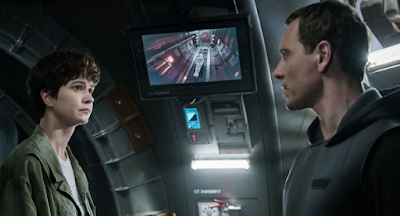 Despite its flaws, Alien: Covenant is in spirit more a horror than it is a scifi, and this is because of how well the David vs Walter dynamic goes over. In second place is Katherine Waterston as Second-in-command Daniels. 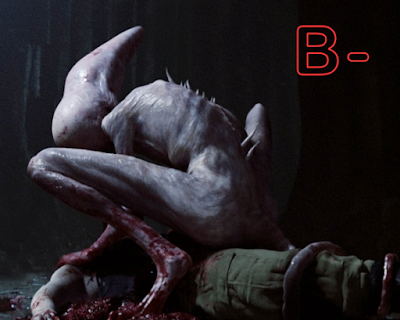 This is the fifth installment in the by-now-creaking bridge that is the Alien series from Ridley Scott. And while the film is not one to write home about, it is worth the price of admission if the previous movies (minus Prometheus) appealed to you. A lot of Prometheus is re-explored here, and both movies share some faults, but this is a much better movie. We thankfully don’t have to revisit that mistake. We need only be reminded of a few details that tie back into that and the original Alien movie in terms of the adaptive changes of the creatures, which never cease to be impressive. Covenant is not beyond predictable. And some of the goofs it makes in trying to build suspense (an alien head-butting its way through the glass of a space vessel just wouldn’t happen) are apparent. Even an enhanced being (biological or mechanical) is not going to punch through a space-worthy vessel. But modern films have a way of getting the physics wrong on things like this when it should be easier than ever to make sure they are lined up correctly. I have been hard on the film, but just remember that Alien: Covenant makes its mark when it comes to the question of playing god and our by-now-deepseated-and-almost-universal fear of when AI is going to take over with a mind of its own.